I'm still having trouble with my pc crashing . ive posted a couple of threads on the problem before. In the 1st one it was suggested it might be a cooling problem, so i installed 2 case fans and a gpu fan, tidied cables to increase airflow-but no joy. this is the thread- graphics card hell!!! In the 2nd thread it was suggested it might be a power problem, so i bought and installed a new psu(enermax noisetaker 370w)- but no joy again. in both the above links i explain the problems, so i wont go into it again. as i explained in the 2nd thread i tried a xp2200+ on my system and it ran no problem. at the moment i cant even run folding@home in the backround cos it causes it to crash. the pic below is of my usdm screen with all my components in it. dont know if it will help but i thought i'd add it on. Last edited by ajopz; 30th May, 2005 at 04:08 PM. i was just playing around with my system and ive seamed to solve my own problem in a way. ive just changed the fsb to 133, so now its running at 133x13.0=1733mhz. this has solved the problem of it crashing all the time. evrything runs stable now and have no problems running prime or folding. does anyone know why it will run stable on 133fsb, but when it goes up to 166fsb which a 3000+should run at stock it is unstable and crashes in test programs. i'm glad that it works but abit p'd off cos i paid for a xp3000+ and um only getting the power of a 2200+. anyone know wot might be causing this? Your CPU (and all of your other components) ran fine in another board, but it won't run at 166MHz in your board, right? Sounds like something is messed up on the MoBo. Check your BIOS and make sure that the RAM/FSB ratio it set up to run syncronusly or 1/1 or 3/3 or 6/6 or whatever they have. Also check for "Spread Spectrum" and turn it off. Have you checked the Northbridge for proper cooling and made sure that it had thermal grease between it and the cooler? ok, checked the bios and both the fsb and the agp spread spectrum are disabled. how do i check the ram/fsb ratios are set syncronusly? couldnt see an option for that anywhere in the bios. no joy, set mem freq to 100% and put fsb back to 166mhz. it lasted about 30 seconds on prime, then hardware error came up. ive sent an e-mail to epox tech uk explaining the problem. if it is the board what is their policy on this sort of thing? 1 year replacement warrenty I think. Maybe 3 years, I'm not sure. How old is the board? Does your northbridge have a fan on it?!?!? No, my northbridge doesnt have a fan. it has the heatsink that came on the board when i bought it. i checked and it has thermal compound on it and it doesnt seem to be getting to hot. 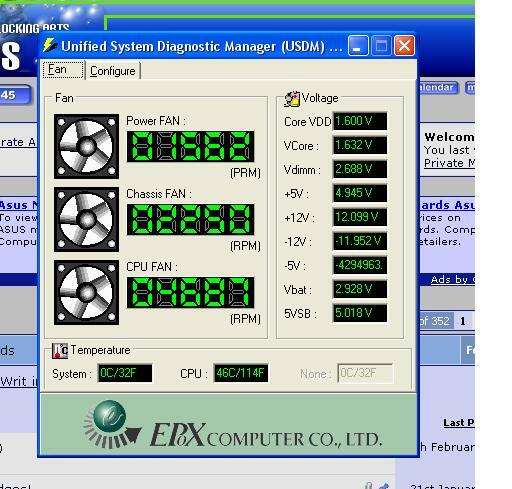 The CPU cooler used is AMD approved or supplied as PIB part and is mounted with good thermal integrity to the CPU die. The chassis has airflow in accordance with AMD's own system build guidelines and specifications for AMD Athlon XP based systems as can be found at their website. The memory that you are using matches directly with modules seen at http://www.nvidia.com/content/nForce...patibility.asp and is running at 166MHz also. My cooler is amd approved and mounted properly with good integrity to cpu die and with decent thermal compound. My airflow around the case is also good and in accordance with amd. But, my memory modules are not on the list in the link they supplied. Are they trying to say my memory is the problem, because i know they are both in excellent working condition. tired that 1 b4 robbie, that was one of my 1st ideas, used a big 10 inch desktopfan, but it dint make any difference. I had loads of problems with an Asus board a while back, sent it to and from the place I bought it. Turned out that was a memory problem - the memory itself was fine and the right spec for the system, but it wasn't on their approved memory chart. Bought some GEIL stuff instead and straight away, problem solved. Don't ask me why this is an issue, but for these manufacturers to list 'approved memory' as part of the specifications... has to be for a reason. Double check that list again for your memory. Note: Crucial memory will be under the name of Micron (crucials parent company) just check the part numbers. One way to check for memory problems is to remove 1 stick at a time and check it in 2 diferent slots. well, i nearly had a fit when i saw crucial wasnt on the list. cheers staz for the parent name. my exact type of memory is on the list. so um relieved about that. ive already checked momery in different slots and on a different mobo and they are fine. i'll e-mail epox back and see wot they say. um stumped, all of my components are working 100% and they are all fully compatable with my board. do u think this is a problem with the board itself? do many mobo maufacturers send out faulty boards? because this problem has been about since ive had it. in reply to staz question, i bought the board between 11-12 months ago. Download a copy of memtest86+ and run it against your system. If you get any errors, repeat the tests to see if the errors stay in the same place or appear to be random. That will help rule out the memory. already tried that, but thanx. it ran with 0 errors in different slots and on different mobo. as far as i can tell every component is 100%, the only question mark is my mobo. 166 / 13.0 = 2167 - crashed - 1 min. 165 / 13.0 = 2145 - crashed - 3 min. 164 / 13.0 = 2132 - crashed - 3 min. 163 / 13.0 = 2120 - crashed - 6 min. 162 / 13.0 = 2106 - crashed - 10 min. 161 / 13.0 = 2093 - running! - still going strong!!! so far its been running for about 2hrs on 161mhz and still holding out. my memory frequency is set to auto, so its coming out at 161mhz aswell. anyone know why it can run fine in 161 but totally rubbish in 166 which is wot it is spost to do? would my memory be ok running at 161mhz?